Nomination Program brings nearly $375,000 more to the Derby! Oklahoma City, Okla. – The National Reining Horse Association (NRHA) Board of Directors recently discussed major changes to the 2012 NRHA Derby (June 25-30 in Oklahoma City, Okla.). These changes and enhancements for 2012 include massive increases in added money due to the NRHA Nomination Program, an increase in the number of Level 4 and Level 3 Non Pro finalists and granting five- and six-year-olds the ability to compete for Nomination Program added money (excluding Nominator Incentives). Find more details on these and other items below. The entry deadline for the NRHA Derby is March 1. Conditions and entry forms can be found at nrhaderby.com. *Note – All added monies (except Prime Time) are estimated and are subject to change due to the Nomination Program. Nomination Program money allocations were predetermined by the program’s conditions. Increase in the number of finalists in the Level 4 and Level 3 Non Pro. Level 4 Non Pro finalists increased from 25 to 30 horses. Level 3 Non Pro finalists increased from 20 to 25 horses. Five- and six-year-olds do not need to be nominated to the NRHA Nomination Program – but they will run at all of the added money (excluding Nominator Incentives). Four-year-olds must be nominated to the program to enter. 2012 brings the first phase of the NRHA Animal Welfare and Medications rule (see item 20 in the NRHA Derby conditions and page 48 of the NRHA Handbook). The first phase includes an anonymous research project with no penalties imposed. There will be a testing fee of $10 due with the May 1st payment. All aged event entries (ancillary entries not included) are subject to examination/medications testing for research purposes. Increase in Non Pro entry fee from $770 to $900 (this includes all fees except stall fees). This change is due to the increase in added money available in 2012. The 2011 entry fee was only 0.4% of the added money. In 2012, the entry fee is still a small percentage (only 0.5% of the added money). Increase in Judges fee by $10 to subsidize the cost of the Show Stewards Program at the event. 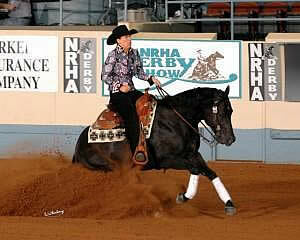 Starting in 2012, NRHA Sire & Dam entries no longer need to enter each division. They can make one payment and are automatically entered into all eligible divisions.